Rare is the company that isn’t looking to make a splash at their next conference, trade show or product launch. The numbers propelling event marketing are compelling enough: according to The 2019 Event Marketing Report from event management platform Bizzabo, most marketers believe event marketing is the single most important and effective marketing channel as it relates to achieving business goals. Even if you’re inclined to look past reports and statistics, chances are you realize that to underestimate the importance of event marketing is to underestimate the power of people. It’s easy to focus on how consumers have more options than ever now, and how it’s made them picky and shrewd, but successful event marketing taps into so much more than that. People crave an experience. And the more engaging and personalized – the better. Not just an experience they get to live themselves, but one they can share, especially over social media. The right marketing provides that livable, shareable, ‘Gramable, Snapchattable experience. It gives people a reason to connect…and then reaps the benefits in marketing ROI. In this piece, we’ll take a quick look at how we at Ripples, along with four additional companies, have utilized creative event marketing that was simply impossible to ignore. What it was: A brand activation for Ripples and the Ripple Maker, our specialized printer that creates high quality images or text on top of beverages – think latte art from a coffee printer. Bev-top media like this capitalizes on a captive moment of total, concentrated attention from consumers. In order to bring bev-top media beyond the realm of frothy coffee drinks and really show what it’s capable of, Ripples partnered with beer giant Guinness to introduce the drink tech on International Stout Day at none other than the Guinness Storehouse in – where else – Dublin, Ireland. A photographer was on hand to snap photos of attendees which were then zapped to the Ripple Maker through the Ripples app and printed atop the silky foam head on a pint of Guinness Stout. With that, the Stoutie was born, as was the #stoutie hashtag. Why it worked: If you were handed a beer with a picture, logo or message printed on it, what would you immediately do? You would take a picture of it and post it across every social media platform you use. Then you’d probably get another beer so you could get another picture. This is one of those times it is perfectly fine to have zero chill, and the International Stout Day attendees certainty didn’t, going wild for each beverage masterpiece and extolling the virtues of this type of marketing in a video from the event. With this success, we truly saw the potential for the excitement that can be created by the Ripple Maker. We can’t wait to see what brands come up with to print on top of drinks at festivals, events, or even just pubs to set themselves apart from the competition. 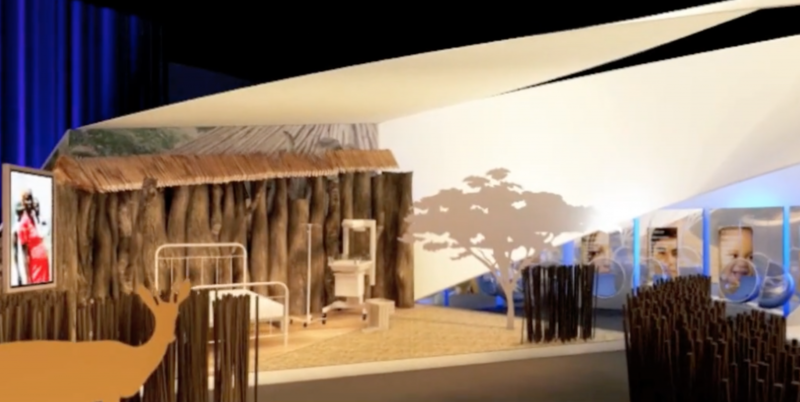 What it was: A B2B conference held by GE that featured specially made movie-style sets illustrating a range of healthcare environments including everything from an American emergency room to a rural clinic in Africa. Doctors who work in these settings gave lifelike demonstrations of their work, as well as the role GE healthcare technology plays in saving lives and improving quality of life. Why it worked: B2B marketing can be a difficult thing with many B2B events running the risk of feeling stiff, stuffy, or too corporate and sales-driven. In addition to providing memorable live demonstrations that gave increased insight into their technology, GE incorporated a human factor with inspirational storytelling from real doctors who had lived the demonstrated experiences. This was a meaningful event that struck a chord with attendees and provided tremendous value, all of which directly reflected on GE. What it was: For their white teas, which they call the lightest tasting teas on earth, Snapple literally took product launches to a whole new level. 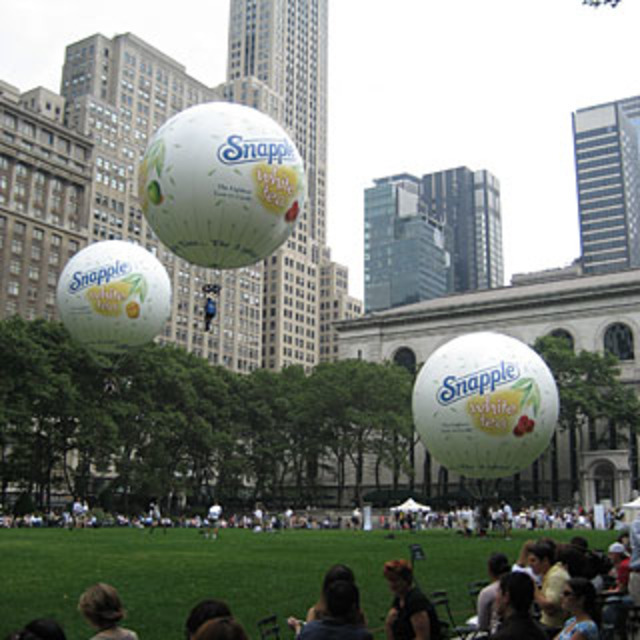 Snapple embarked on a nine city tour of the United States, bringing three massive hot air balloons, each one done up like a Snapple label with a different white tea flavor on it. Guests got to go up 1,200 feet in the air while samples of the new teas were distributed on the ground. Guests got to go up 1,200 feet in the air while samples of the new teas were distributed on the ground. Why it worked: This actually took place in 2010, if you can believe it. Snapple was truly ahead of the times in capitalizing on experiential marketing and all the resultant press coverage that can stem from it. Not only did these hot air balloons create a giant spectacle in every city they went to, but the event was also just plain old fun for the people who got to attend. Who wouldn’t want a free ride in a hot air balloon? Other than acrophobics, of course. All told, Snapple gave out over 21,000 samples of their new beverages and the publicity stunt registered 33 million media impressions including photos and write-ups in publications like BrandWeek and the New York Times. If this tour took place in 2019, you know it would be trending. What it is: An annual fundraising gala held at a planetarium to raise funds for a new modern art gallery in the city of Calgary. Attendees are able to purchase tickets at different price points, starting at a $25 ticket for access to just the afterparty and going all the way up into the thousands for a private meal prepared by a celebrity chef. The LOOK gala has come to be known as one of the hottest parties in all of Canada, and it always sells out well in advance. As a result of the five years this gala has been running, Contemporary Calgary has been able to purchase its dream gallery facility. When you think of sophisticated cities with world class modern art galleries, you probably don’t think of Calgary, Canada. In the next five years, you will, and that is almost solely because of the LOOK fundraising gala. Why it works: In an area known for oil workers and a hockey team, the LOOK gala dials the glamour up to 11 with vividly colored carpets for guests to walk (red would be too pedestrian), a multi-course plated dinner, a private program and entertainment for VIP ticket holders, an art auction, major starpower hosts that have included Steve Martin and Schitt’s Creek star Dan Levy, a neon warehouse after-party with live art installations and quirky cool bands, and an attention to detail that includes event managers ensuring every guest has a safe ride home. A true door to door experience. Regardless of the demographic in question or what level of ticket was purchased, everyone who attends the LOOK gala gets a meaningful experience that feels as though it was crafted specifically for them. Quite a feat for an event attended by hundreds. What it was: To stand out at the Arnold Sports Festival, an annual bodybuilding event named after Arnold Schwarzenegger, Optimum Nutrition turned their trade show booth into a virtual reality gym, including a workout challenge that saw top performers walking away with product prizes. Competitors donned virtual reality glasses to enter an Optimum Nutrition branded gym – complete with product placement, of course, and competed to do the most squats and bicep curls in 30 seconds. Why it worked: Talk about knowing your audience. Not only did Optimum Nutrition brilliantly use tech to transform the relatively small footprint of a trade show booth into a full-on gym experience, but they tapped in to the competitive side of the buff, exercise-minded Arnold Sports Festivals attendees with some simple gamification. This is an example of event marketing that perfectly showcases a brand’s spirit while also demonstrating how well the brand understands and aligns with its target market. Over the course of the three-day event, over 1,200 attendees participated in the VR gym competition and Optimum Nutrition earned exposure on social media and in industry publications. The trend in event marketing is leaning heavily towards experiential marketing, and with creativity being prioritized, there’s no limit to the innovation in events we’re going to be seeing over the next few years. Consumers are ready and waiting to have their socks knocked off so they can take a photo or video and share it with all their followers, and brands are bringing it.